Best car interior dressing does exist if you know where to look. Car interior dressing is a love/hate relationship for me both personally and professionally. As a rule I am not a huge fan of shiny, overly dressed car interiors. 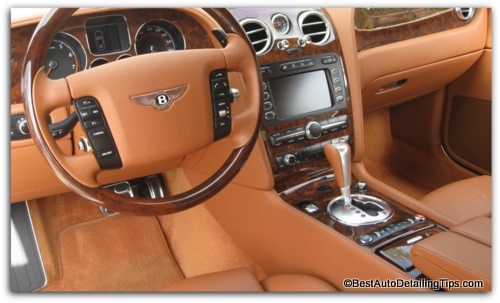 But car interior dressing has a place in the world of not only professional detailing, but in the world of cars owners and enthusiasts alike. Whether we are discussing vinyl dressings or leather conditioners, the problem is that most people become hyper-focused and short sighted. As car owners they become fixated on rushing out and shopping for the best auto interior dressing thinking this is the cure-all to keeping their car's interior looking brand new, protecting it, and nourishing the many materials that a person might choose to use a dressing on. "The world is full of short-cuts and most people look for quick fix solutions. Dressing the interior of your car is a perfect example where people grossly misunderstand how their ignorance and short sighted strategy actually produces the exact opposite result they were originally after." 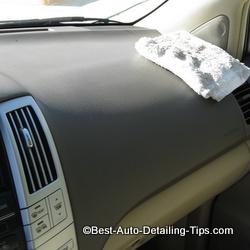 There are (2) common mistakes people make when it comes to using a car leather and/or vinyl conditioner. First, they don't realize that 99% of the time the car leathers of today are finished with a clear protective coating. So all those fantasy's of using a high grade leather conditioner to work into your cars leather like we did as kids on a brand new leather baseball mitt, need to be dismissed altogether. What you are really dealing with is a synthetic coating, not the natural leather. Therefore depending on who you ask, conditioners become a non-issue and irrelevant. You can go to car leather care for more information regarding the process and the different types of leathers. When it comes to conditioning the vinyl in your cars interior, you need to understand that unless you are in love with the glossy, shiny look of dressings or conditioners, your vinyl needs to be first and foremost kept clean. Due to advances in manufacturing, the vinyl's of today are far superior than the vinyl's of yesterday. What happens is most people become fixated on searching out the best car interior dressing and/or conditioner, and run off to slather layer upon layer of dressing in their car. Meanwhile, they forget the most important part of the process; CLEANING. What is then created over time is a greasy build-up of dirt and conditioner. Q. What is the difference between a dressing and a conditioner; they seem to have the same effect when I apply them? A. No real difference between the two. Since most of us are not chemical engineers or formulators, none of really know for sure. Like so many areas of car care and life, we have to rely and trust on the industry, manufacturers, and so-called experts. As a rule, dressings and conditioners are interchangeable. A good place to start is by reading the product labeling. Q. It would appear Darren that you are not a big fan of dressings as a rule? A. You are correct! But for every rule, there are exceptions to the rule. There are times when the leather has aged and I believe that a leather conditioner or a car interior dressing of some kind, will in fact make the leather or vinyl within the car not only look better, but also feel better. I accept the trade-off of creating a more shiny appearance. Q. How do you determine the appropriate time to use a dressing? A. As a rule, I only apply an interior car dressing at the request of the customer, or if I determine that in order to achieve a uniform appearance, an interior car dressing is needed. Generally any black or dark colored interior will require the limited use of some form of dressing or conditioner. I also occasionally come across car leather that needs some form of dressing or conditioner to make it not only look "better", but makes it feel better. Usually the car leather and/or car vinyl will naturally look and feel better through traditional car interior cleaning methods. This picture above represents what the car dash would look like with traditional car interior dressing on the left and after it has been cleaned on the right. 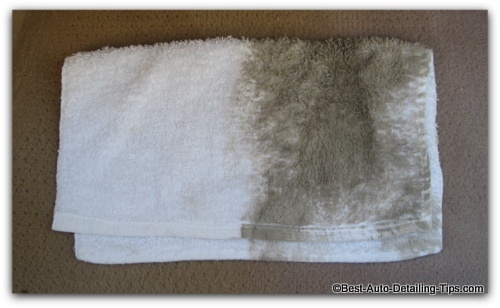 This is the rag I used to clean the excessive build-up of the car interior dressing the owner had kept reapplying year after year without cleaning the dash before each new repeat application. I realize there are many of you reading this that like the ultra simple approach to everything car care. You accept that there are certain requirements, but don't want to over-think any of these areas. You just want a direct and simplified answer and approach. Which is why I chose the Meguiar's product below. Cleaner and dressing all in one. What most people don't realize (and the industry will not teach you) is that car leather is actually coated with a water-based clear coating that in many ways is a form of plastic. While this may be disappointing to many, it is actually the good news as it makes your car leather easier to take care of. 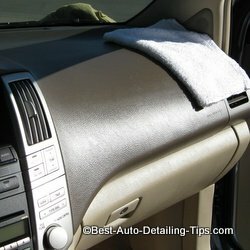 For a full write up on car leather, see my dedicated car leather page if you want to become part of the truly "informed". Makes it on my list of "Must Haves". I use it sparingly and mostly on black interiors to create a uniform appearance. This will not only create a shine, but make the material "feel better". Is as easy as easy gets. Light aerosol dressing can be sprayed and let be, or "knocked down" by rubbing lightly with micro-fiber cloth to reduce shine. Can be used for both interior and exterior. Literally any surface you feel needs to be rejuvenated due to excessive aging. The actual dressing I use professionally when heavier layers of dressing are needed, or larger areas need to be dressed. Can be diluted down with water to custom blend to your exact needs. Suitable for tires, leather, vinyl, plastics, interior, exterior. Formulated for both interior and exterior use. Convenient sprayer applicator bottle that many will prefer over the VRP above. All these products make my "Must Haves" list. For a light, easy to use dressing that is ideal on any intricate parts, I reach for the aerosol spray dressing. For all the larger areas I choose to apply dressing, I reach for the VRP or the TVD based on how the exact product is responding to the material I am applying it to. (Unfortunately, not all materials are created equally. Often a product may work wonders in one car, then prove less-effective in another car. I can't control that and is simply part of the nuances of life and car care). I hope this page is comprehensive enough so that you walk away with enough understanding to not only make an informed decision, but to put what you have learned into play. You can do me a favor and pay this page forward, sign up to my YouTube channel, or simply share the link to someone else you think could also benefit from all the info I have spent much time configuring into this car interior dressing page.